The history of Ило - behind which we find Nico Selen of O.R.D.U.C, E.M.M. and many other guises - and Freiband, the name of Frans de Waard when it comes to all sorts of computer based, goes back for over 20 years. Selen was the first to release a LP by Kapotte Muziek (De Waard's other music enterprise, among many! ), in 1990 and they have been off and on in contact. Earlier 2013 Ило released a very limited CDR, which De Waard quite liked and in the next days he kept returning to it, eventually bending the material himself and sending the results back to Ило. 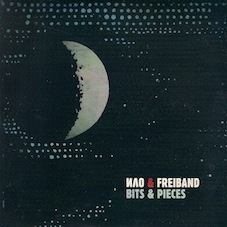 He then added more electronics to the music according to various mathematic principles and the result is now released on 'Bits & Pieces', a calm and sometimes disturbing album of deep ambient music from the world where there is no air, just endless humming of satellites. Cosmic music, but without the endless doodles on analogue synths, but entirely created in the world of computers. It always retains a warm character.